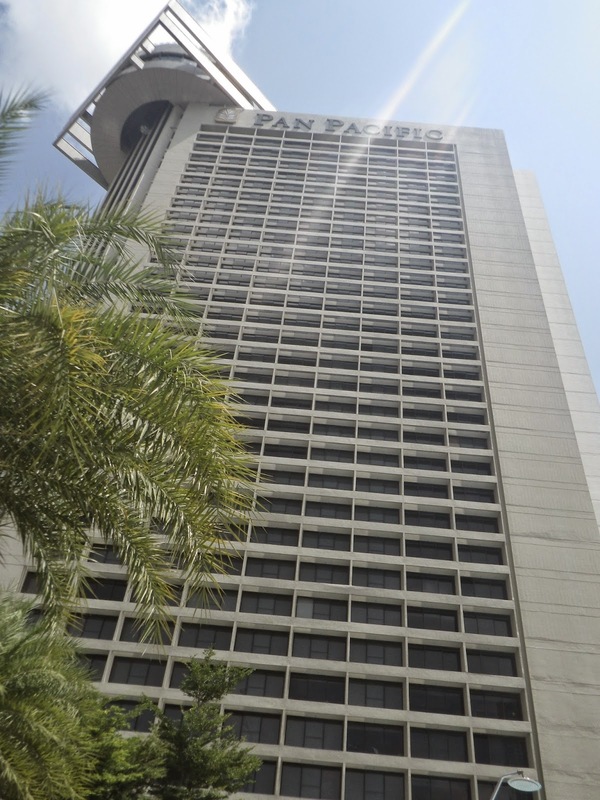 Located in Marina Centre shopping area, Pan Pacific hotel is a great place to stay for those who prefer a convenient location with lots of shopping and eateries around. 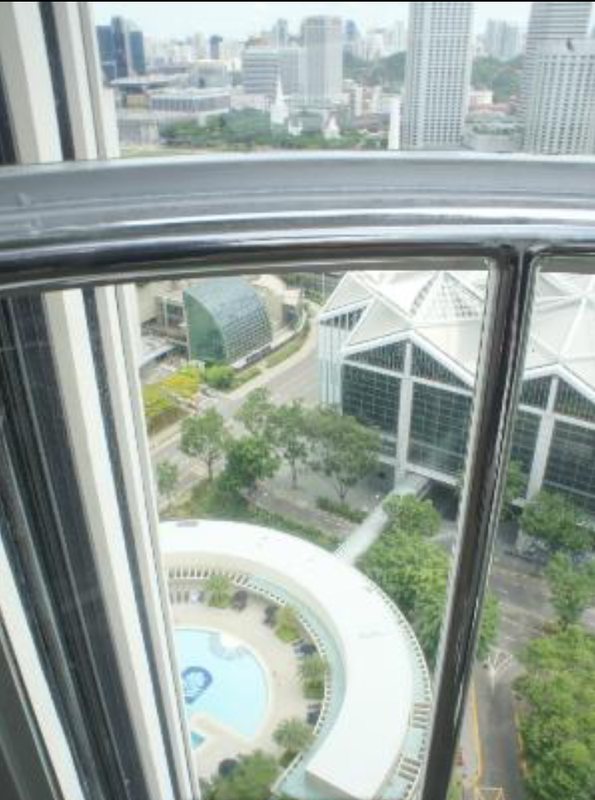 The hotel is also centrally located in Singapore, making traveling around Singapore a breeze. However the subway station is a tad far from the Hotel. One would have to go through the shopping mall in order to reach the subway station. We were upgraded from the Habour View Club room to the recently renovated Harbour View Suite. Upon entering the room, a long corridor greeted us. just to the right side of the room is the walk in wardrobe linked the bathing area. There are no lack of storage space in the walk in wardrobe and is huge enough to stow 3 large sized luggage. The safe can also be found here. The room can be segregated in to 3 areas, Bathing area, Couch area and sleep area. The bath area takes up about half the size of the room. 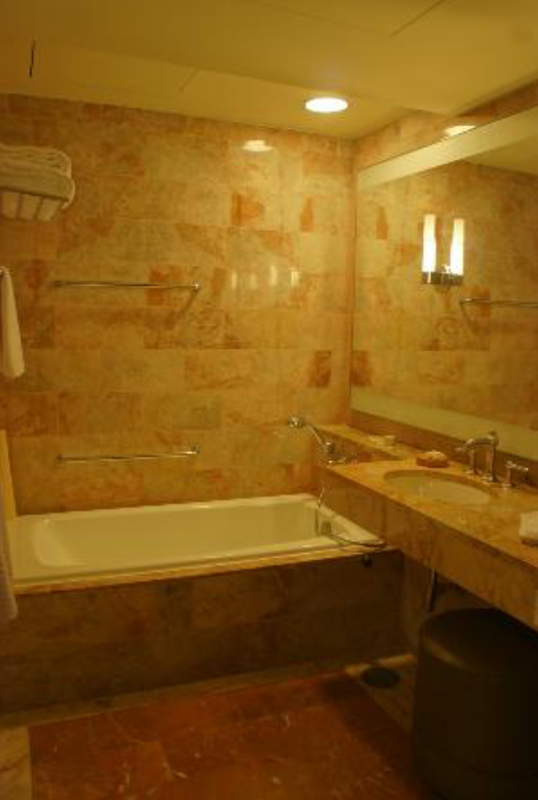 The lighting in the bathroom, as well as the whole room was sufficient and gives one a cozy feeling. 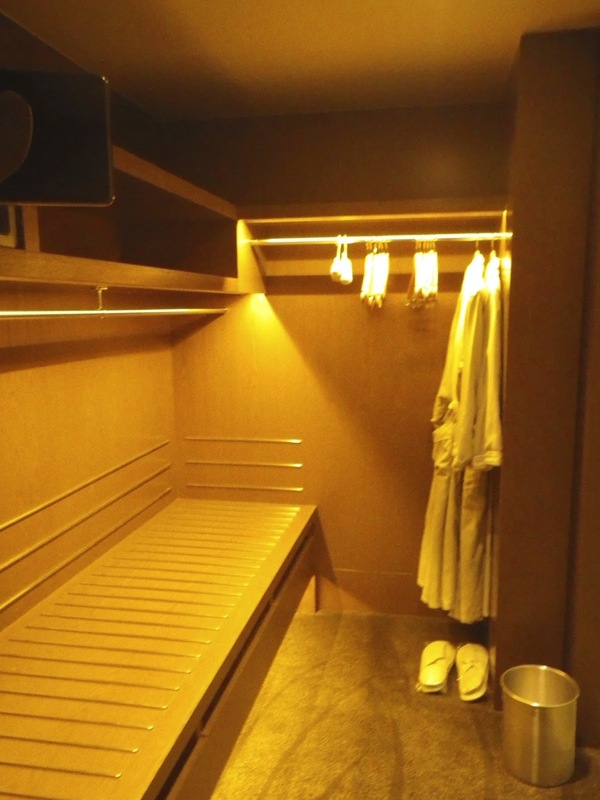 Just after the walk in wardrobe are two glass cubicles, one for toilet and one for shower, with a rain shower head and a bench. 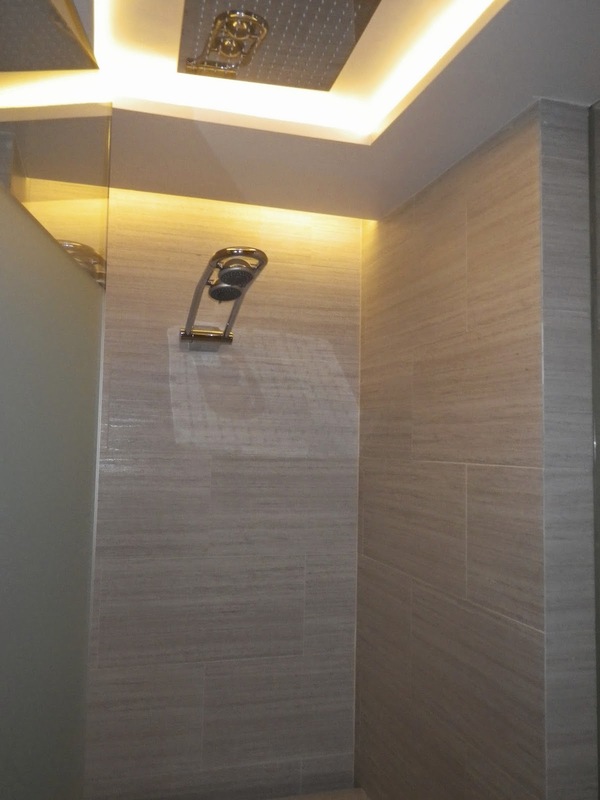 The lighting is in these 2 cubicles are well designed and the pressure from the rain shower head is fantastic. 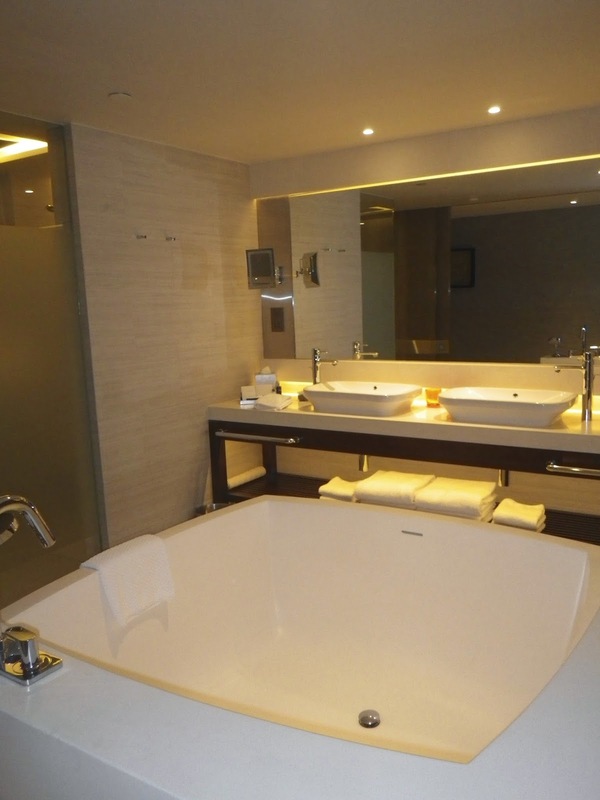 After the 2 cubicles, one can find a huge square bathtub, which is large enough for 3 people and a dual sink. There isn’t any locks on the doors to the bath room and these doors can be slide away to give one a spacious feeling of the room. The couch area can be found just after the bathtub. The simple, yet functional couch area features a 3 seater couch, facing a LED TV. Between the couch and the TV is the study desk for guests to use as a study desk. 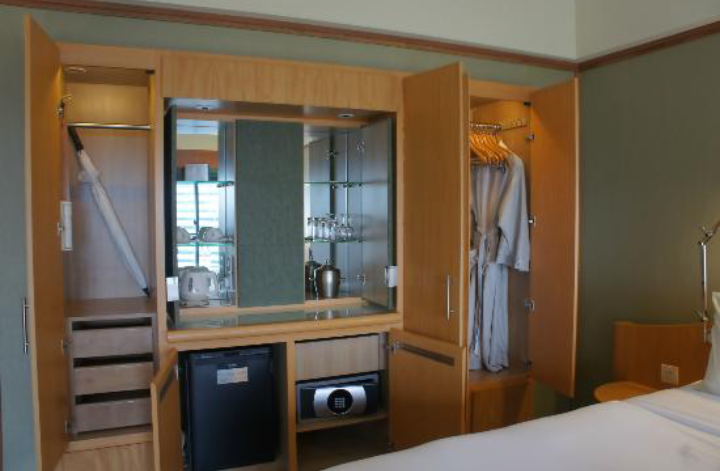 The mini bar and nespresso machine can be found in this area of the room. There are sufficient glasses for guests to enjoy various drinks that can be found inside the fridge, which is neatly tucked away in one of the cabinets in this area. The non-alcoholic drinks are complementary. Beside the couch is a side table, which is large enough for it to function as a small dinning table for 2. 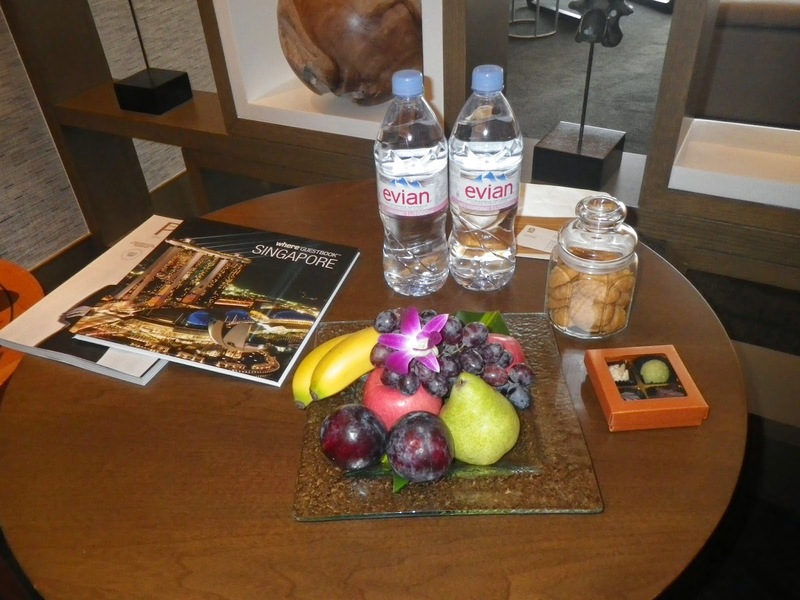 There are welcome amenities such as fruit platter, 2 bottles of Evian water and a jar of cookies. The cookies tasted great. Separating the couch area and the bedding area are 2 see through shelvings, where the hotel displayed some artefacts for decoration. The bedding area is rather simply designed, but yet functional. This area features a very comfortable huge king size bed, a single seater armchair by the floor to ceiling windows, another TV as well as 2 bedside tables. The whole room is well designed and gives one a cosy feeling, a home away from home feeling. The centre of attraction in the whole room got to be the bathtub. The view of the room we were allocated is facing Marina area, which offers stunting views of the area. 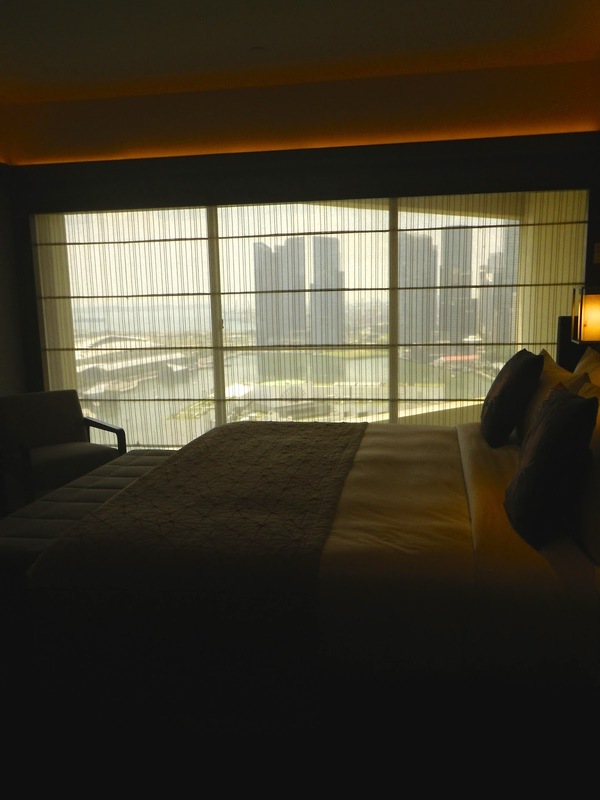 Guests can also enjoy the light shows displayed by Marina Bay sands at the comfort of the bed. The room is well decorated without giving guests a feeling of being too cluttered. 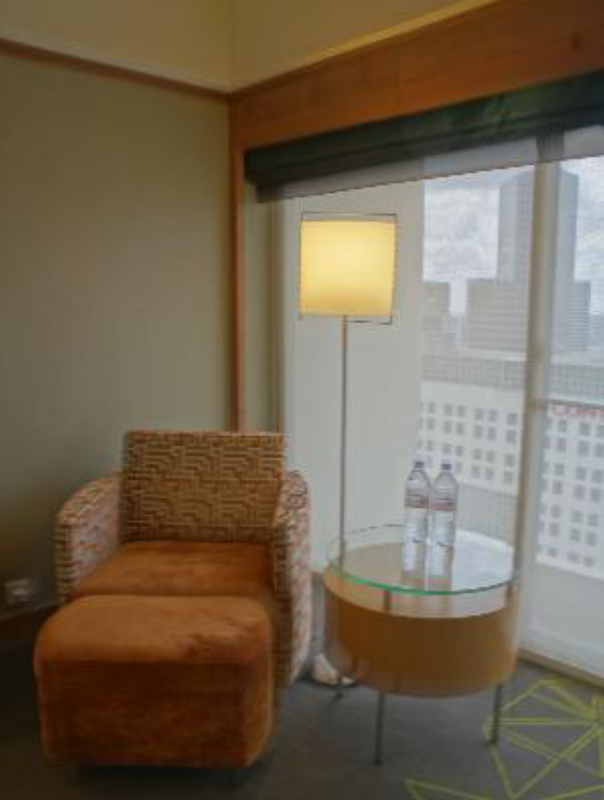 Guests staying at the club floor are given access to the 24 hour Pacific club, which is located on the top of the hotel. The views at this lounge is simply stunting, great for relaxing and chilling at any time of the day. There are snacks available in the lounge at any time of the day, and some finger food at allocated timing. The pool area is great. staffs can be seen walking around clearing towels and offering ice bottled water to guests who utilised the pool. Locker keys are also available from the staff at the pool side should guests opt to deposit their valuables in the changing room. We have gotten a harbour view club room. This time round my impression of the hotel changed dramatically. We were greeted by the duty manager upon arrival and escorted to our room immediately for in room check in. We do not have to go through the hassle of queuing and waiting for a staff to be ready to check us in. The ride from the ground floor to almost top of the floor in the outward facing bullet left is always pleasurable. The services at the lounge is simply amazing, a far marked improvement from the last time I stayed here. 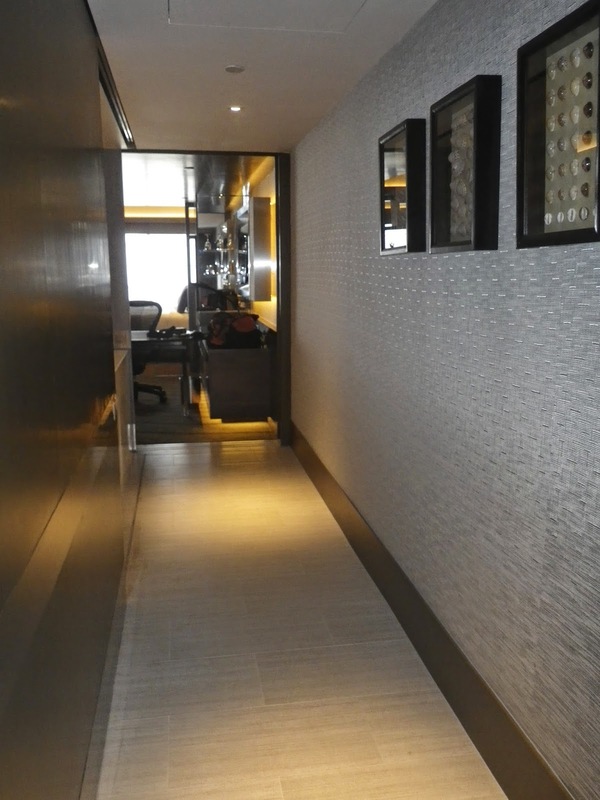 Staffs readily greeted guests who walked into the lounge from the lift. Drinks are offered upon guests picking their seats. The services offered by staffs here are warmth and attentive and yet not disruptive. The staffs generally are rather observant and did their due rounds to ensure any empty plates/glasses are cleared almost immediately. The friendly staffs also took the extra effort to engage guests, almost eager to find out how their day has been and are not stingy in recommending things to do around the Marina Area or within the hotel. All guests are treated equally, a marked improvement from my last visit where discriminatory behaviour was observed. This time round, Pan Pacific got the receipe right. Food were topped up in good time, with staffs constantly checking the level of the food and topping them up as soon as the supply seem low. We had breakfast at the Edge restaurant. Staffs were ready to greet guests and the spread of food at the restaurant was fantastic for breakfast. There are options for both eastern and western guests, catering to a variety pallets of guests. However one short coming we have observed is the staffs clearing the plates without even acknowledging the presence of guests, despite guests still seating at the table. The staffs just cleared the plates away without even asking or checking with guests. Overall the hotel has at the hardware and the software to make guests feel comfortable and readily accommodate to guests requests. The staffs even went extra mile to ensure guests are well taken care of. In an instance, we were chatting casually with a staff (Mia) at the club lounge and we mentioned that we might not have sufficient time to pack up as our room is in a mess. Upon hearing this, Mia excused herself and returned 5 minutes later to deliver good news to us, she had taken the initiative to check if our room was available and had extended our check out timing by another 2 hours, despite we did not request for this. Such attentive and thoughtful service is apparent throughout the hotel. Other then our experience at the Edge restaurant, the hotel is great and fantastic. A truly 5 star hotel, that delivers 5 star experience to guests. 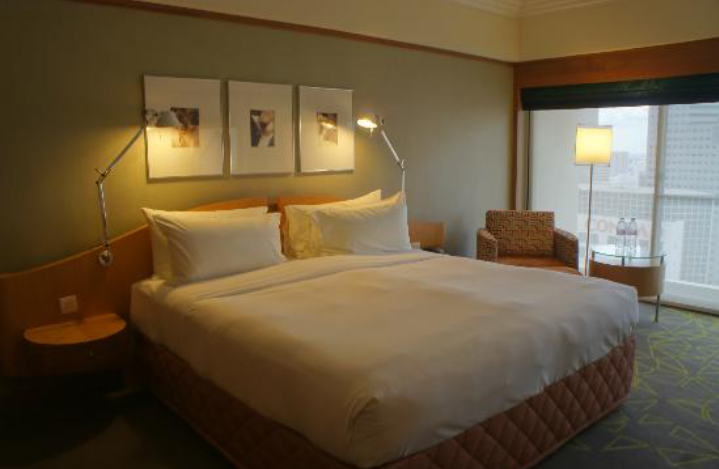 Located in Marina Centre shopping area, the hotel is a great place to stay for those who prefer a convenient location with lots of shopping and eateries around. 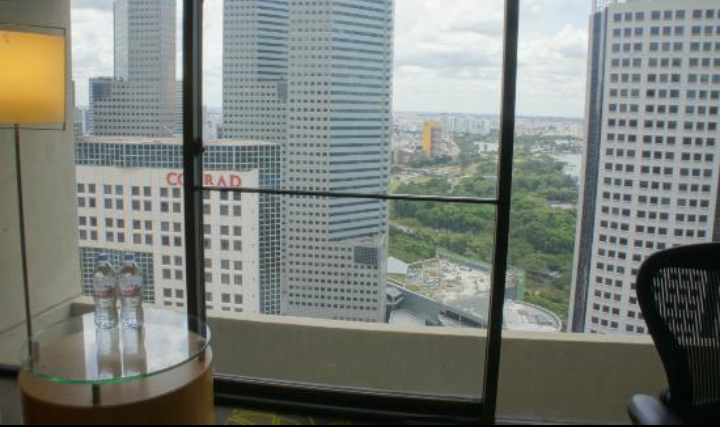 The hotel is also centrally located in Singapore, making travelling around Singapore a breeze. However the subway station is a tad far from the Hotel. One would have to go through the shopping mall in order to reach the subway station. The room felt rather small and aged. Bathroom greeted patrons on the left upon entering the room. The Bathroom is small but functional. 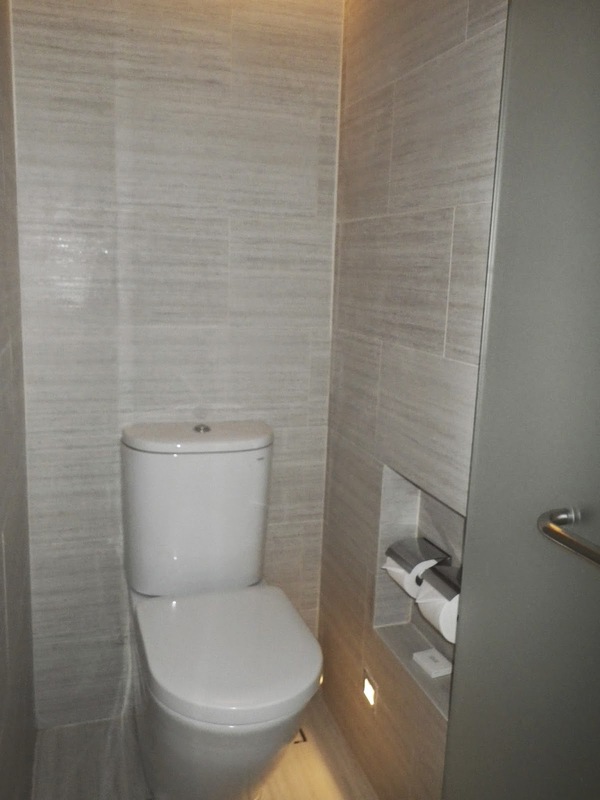 The design, the colouring of the bathroom seem to yell of a need to refurbish. The brownish tiled bathroom looked like a page from 1980s. The bathtub is rather small, even for me (I am around 1.65m tall)! There is a walk in shower cubicle and a toilet cubicle. 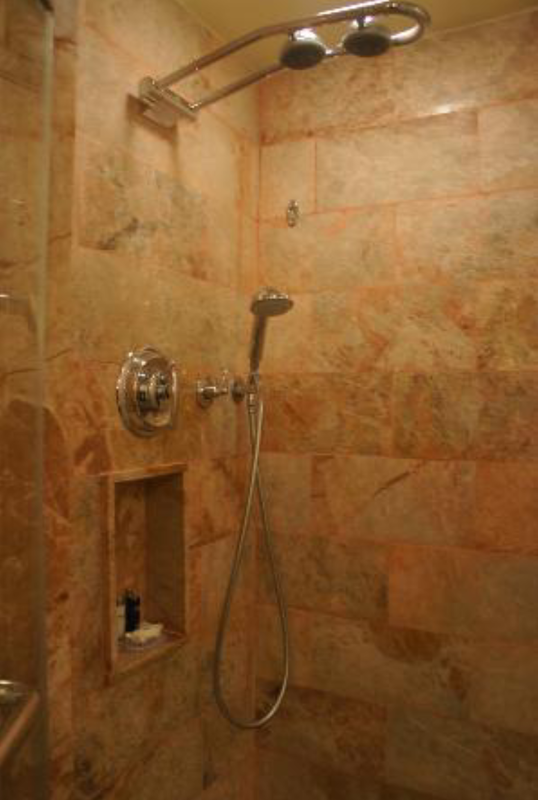 The walk in shower was small, and the shower did not even feature rain shower, but 2 shower heads. I do not see any purpose it served as there is also another single shower head just next to it. The toilet cubicle is just functional. The sink area is rather large I would say. 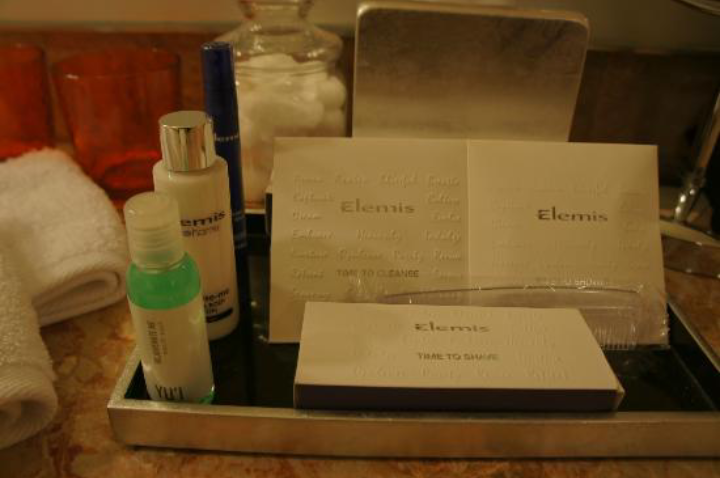 Given all these, the bath amenities provided is of high quality. The hotel even provide Face mist for their Pacific Club room guests, which is a gesture worth welcoming! 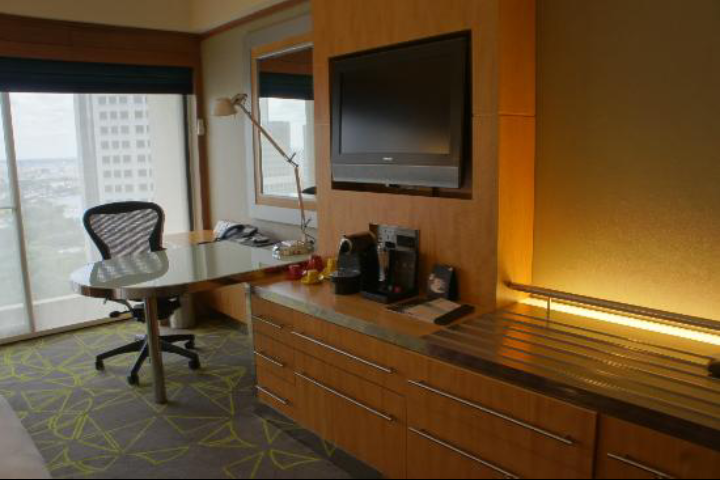 The room features a king sized bed, a work desk and a concealed counter for the minibar. The bed was rather comfortable, I had no problem getting a good night sleep, partially crediting to the pillow i had chosen from the pillow menu for Pacific Club room guests. the concealed counter looks neat and tidy, both when opened and closed. This is an interesting way of putting away the clutter of the glasses and mugs. The mini bar fridge is rather interesting. In it there is a notice informing guests that drinks removed for more then 30 sec will be charged to their bill. I guess this is how the hotel make use of technology to cut short check out timing. The work desk is function, facing the door. The large work desk has a number of powerpoints for guests to plug in their gadgets. 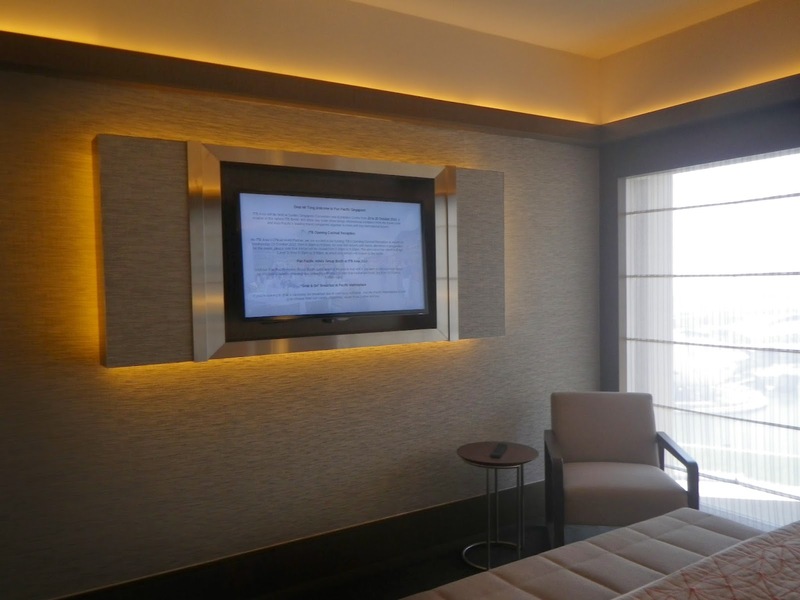 This is a feature that is evident throughout the room, which little hotels provides! 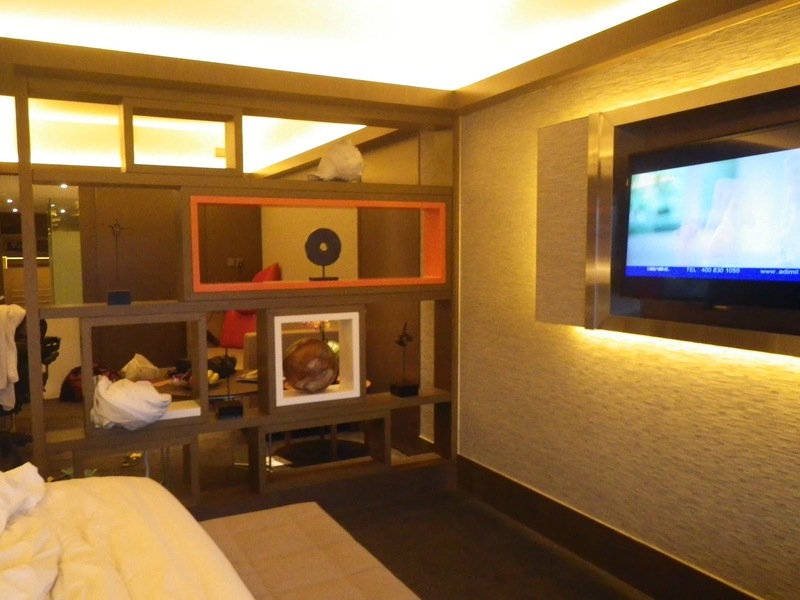 Right next to the desk, facing the bed is the LCD TV, with a panel for guests to plug directly into the TV, using ports like HDMI, USB, etc. In front of this panel is the Nespresso machine, which comes along with 3 capsules for guests to enjoy great coffee. The wardrobe is a tad small, when compared to most 5 star hotels. Overall the smallish room is still functional, with a lot of storage space, other then the wardrobe. The experience was horrendous even before my checking in. I called on the day of my checking in to check if an early check in was possible. However to my dismay, the staff over the phone was rather patronising. Without even asking for my name, she seemed to automatically assumed that I had booked a “normal” room. I had to resort to get her to check, and was put on hold, 5 secs later she still came back with the same answer. All these while she seemed disinterested in providing good service, she did not even ask for my family name to check the type of room I had reserved. I gave up on her and got her to transfer my call to front desk, only at this point she insisted in getting my family name, which I saw no purpose in giving, since the front desk staff will be asking for the same information. Irritated, I insisted her to transfer my call. After transferring my call, to my delight, an early check in was possible. To think I had wasted 30 mins on the phone with a useless staff who did not even bother to check. I had thought the bad service would end there, but more to come. Upon arrival at the hotel lobby, I approached a staff asking about the dedicated counter for Pacific Club rooms (I read this from Tripadvisor). However I was told to queue up at the counter for all other guests. When I told the staff about the dedicated counter, we were “transferred” to another staff and was told once again to queue up at the normal counter. Once again, I told her that I booked a Pacific Club room and made known to her that I know of this dedicated counter, then we were ushered to the Pacific Club counter. check in was breeze, but we were given wrong information about the facing of our room. 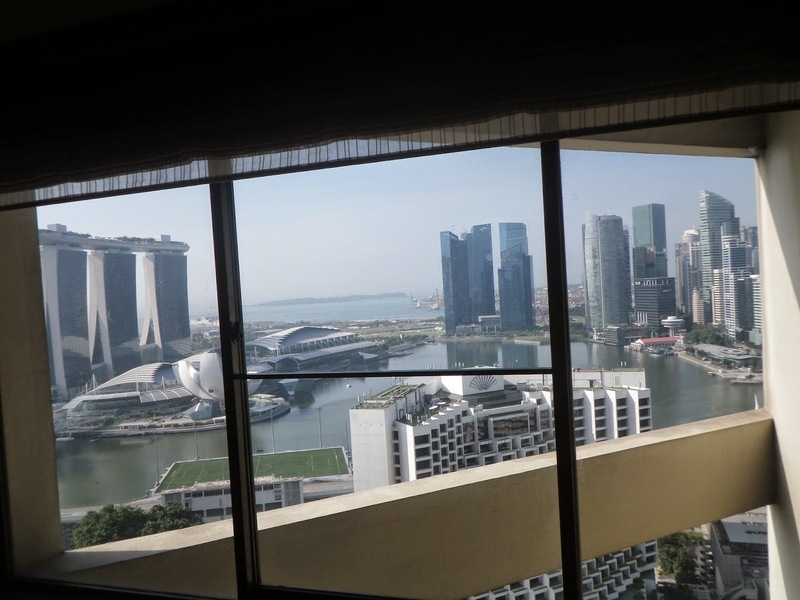 When we checked in, I asked the staff which view were we assigned, she claimed that it was the side that faced Orchard Road and we would even get a glimpse of the bay area. 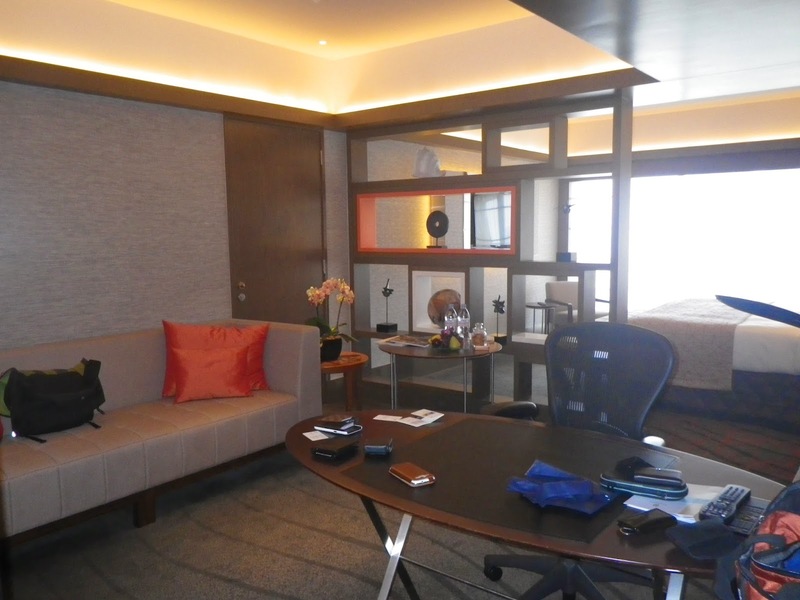 However upon entering the room, we found that our room was facing Conrad hotel. Which I specifically told the staff at check in that this is not what I preferred!! Throughout my stay I have observed numerous discriminatory behaviour displayed by the frontline staffs, and some of them occurred on me. 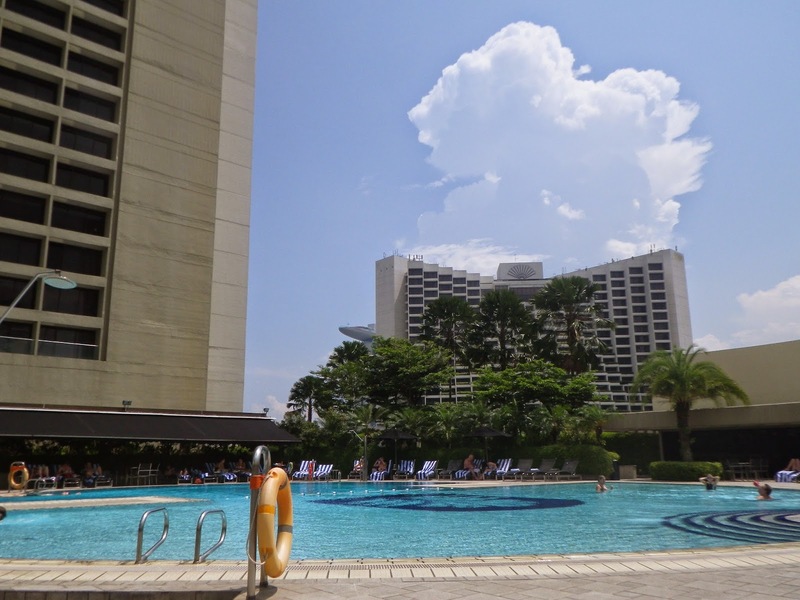 The first thing after checking in was to head to the pool for tanning and a dip. 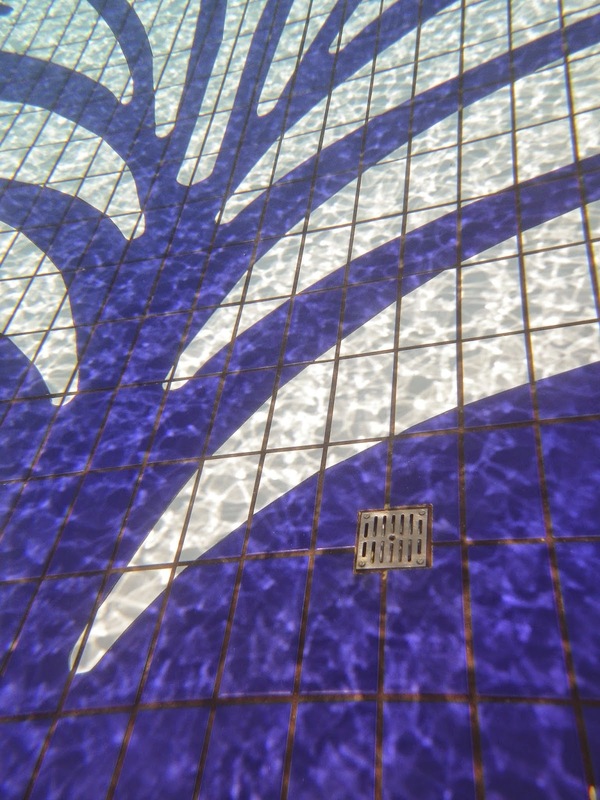 When I reached at the pool, the staff handed over the towels and even offered me cold water. After I found a place to settle down, as I was observing around, I noticed the Caucasian guests were treated better then their Asian counterparts! Several occasions, I observed that the Caucasian guests were escorted to the chairs and even had their towels laid out by the pool staffs. However I did not notice that happening on the Asian guests! All of the Asian guests were made to find a chair themselves and had their towels laid out themselves, unlike the Caucasian guests, where service standard is much better! I can’t help but to wonder why is the hotel condoning such difference in service standards! As I thought this is a one off event and only specific to the pool area. After suntanning I headed to the highly acclaimed Pacific Club lounge. The hotel has removed a couple of restaurants previously occupied on the top floor and replaced with the Pacific Club lounge. I was rather excited about visiting this lounge even prior to my stay. However, such excitement is short lived. Upon arriving at the club lounge, the staffs did not even make the effort to initiate eye contact. Most of the time, I was left wondering what drinks were available and most of the occasions, I had to help myself to the drinks that were displayed. There is only one time we were offered drinks upon arrival. Most of the time, the staffs were seen talking to each other, rather then going around asking arriving guests what drinks they want or even offer a simple “welcome”. However during my stay at the club lounge, I also observed discriminatory behaviour by the staffs. All the Caucasian guests were greet by a warm welcome and were approached for drinks orders as compared to the Asian guests. At one point, one of the staff even warmly checking on the Caucasian guests, while a few occasions when we were there, we were treated as though we were transparent or even given dirty looks by the staff there. Is this the way they treat Pacific Club room guests who paid a premium over the other type of rooms?? I was at the club lounge for evening cocktail, and managed to wave at one of the staff for drinks. Across the table I observed the other Caucasian guests were given iPad menu and had the privilege of selecting the club offerings at their leisure. However I was not given such a chance, but had to rely on the memory of the staff who ordered our drinks. Why is there such a difference in service, even at the club lounge?? Does that signifies the hotel only are interested in serving Caucasian patrons over their Asian guests?? The afternoon tea and evening cocktail selection of food was pathetic! I have been to several club lounges by other hotels, this gotta be the most pathetic of all. Granted the area of the Club lounge is huge, but the club lounge lacked the software that will keep patrons coming back for more. The worst gotta be the breakfast. 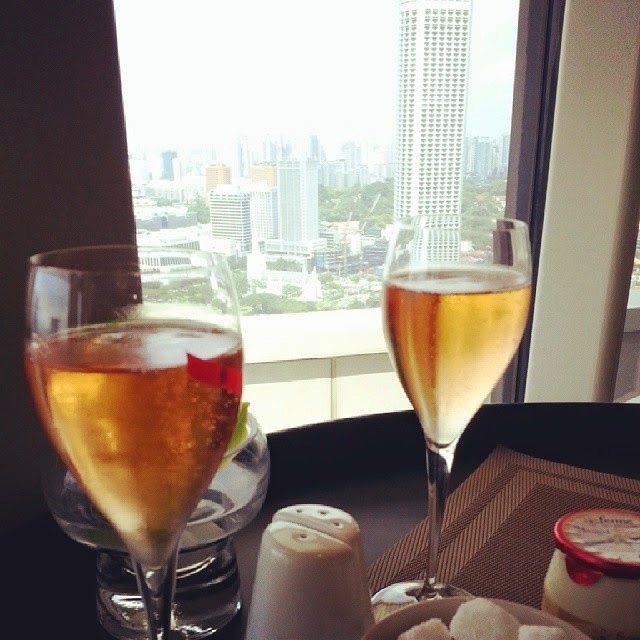 As I preferred the tranquility at breakfast over the wide variety offered at the Edge Restaurant at level 3. To my dismay, despite being at the club lounge at 9.30 am, ALL the food offered for breakfast was GONE!! The staffs at the club lounge did not even bother to replenish the food!! What a joke when the hotel promises champagne breakfast and here I am to find there are only champagne (which I was not even offered throughout my visits to the club lounge) and NO BREAKFAST!! Disappointed and disgusted, I had to queue up at the edge for breakfast. Fortunately the staff at the edge displayed more passion towards providing good service than those at the Pacific Club lounge! Having paid a premium for a Pacific Club room and yet was discriminated upon, makes one feels the money was NOT well spent! One would probably get better service for a normal room at some other hotels nearby (such as Ritz Carlton), then this hotel.